The White House said Thursday it is taking seriously the allegations of some former American hostages who say the believe that Iran's president-elect was one of their captors in the late 1970s. "I think the news reports and statements from several former American hostages raise many questions about his past," White House press secretary Scott McClellan said of the Iranian president-elect Mahmoud Ahmadinejad. "We take them very seriously and we are looking into them to better understand the facts." Former hostages Chuck Scott, David Roeder, William J. Daugherty and Don A. Sharer told The Associated Press that after seeing Ahmadinejad on television, they have no doubt he was one of the hostage-takers. A fifth ex-hostage, Kevin Hermening, said he reached the same conclusion after looking at photos. A close aide to Ahmadinejad denied the president-elect took part in the seizure of the embassy or in holding Americans hostage. "It stopped me cold in the middle of the room, and I knew, it wasn't one of those things, where, gee, you know that's a familiar face," Roeder said on CBS News' The Early Show. "I knew absolutely and immediately where I had seen that guy before." The hostage-taking, which came in reprisal for Washington's refusal to surrender ousted Shah Mohammed Reza Pahlavi for trial there, contributed substantially to then-President Jimmy Carter's defeat by Ronald Reagan in the 1980 election. Militant students seized the U.S. Embassy in Tehran on Nov. 4, 1979, and held 52 Americans hostage for 444 days. The shah had fled Iran earlier that year after he was overthrown by the Islamic Revolution. Another former hostage, retired Air Force Col. Thomas E. Schaefer, said he doesn't recognize Ahmadinejad as one of his captors. 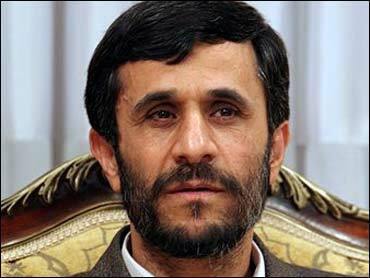 Several former students among the hostage-takers also said they did not believe that Ahmadinejad had taken part in it. President Bush was asked about the allegation in an interview with The Times of London conducted Wednesday and published Thursday. A transcript on the newspaper's Web site shows Mr. Bush did not comment directly on any role that Ahmadinejad may have played in the hostage-taking, but said "time will tell" whether the United States and its allies will be able to work with him. The president said that Ahmadinejad's first test will be whether he is prepared to negotiate in good faith with Britain, France and Germany about Iran's nuclear ambitions. "They should not be able to develop the technologies that will enable the enrichment of uranium which will ultimately yield a nuclear weapon," Mr. Bush said. "I say that because they tried to do that clandestinely before, which obviously shows that there's a conspiratorial nature in their thinking." The former hostages insisted they were certain that the president-elect was among their captors. Daugherty said it's further evidence that the State Department should stop defending Iran's immunity from lawsuits filed by the former hostages seeking reparations. In April 2002, a federal judge threw out a lawsuit by the hostages seeking $33 billion in damages. The State Department intervened, arguing the lawsuit would violate the U.S.-Iranian agreements that freed the hostages and would damage U.S. credibility. "This puts the Bush administration in an interesting position," Daugherty said. "You know how he said, `You're either for us or you're for the terrorists.' Well, now the leader of Iran is a terrorist." Ahmadinejad was a member of the Office of Strengthening Unity, the student organization that planned the embassy takeover, but he was opposed to taking the U.S. Embassy, several of his associates said. Mohammad Ali Sayed Nejad, a longtime friend of the president-elect, said that in 1979, "Ahmadinejad had focused his fight against communism and Marxism and he was one of the opponents of seizing the U.S. Embassy. He was a constant opponent." Some former hostages couldn't be sure about their captors. Former Marine embassy guard Paul Lewis of Sidney, Ill., said he thought Ahmadinejad looked vaguely familiar when he saw a picture of him on the news last week, but "my memories were more of the gun barrel, not the people behind it." In a first-person account on the British Broadcasting Corp. Web site, world affairs editor John Simpson said he, too, recognized Ahmadinejad, saying there was something "faintly familiar" about him. "I realised where I must have seen him: in the former American embassy in Tehran," Simpson wrote. "We knew from what other guards had told us that he was a leader and he was a, what I'd call a 'hardass' (tough character), and even some of the regular guards referred to him as being very strict and very anti-American," Scott said.